Here at The Leaky Cauldron, things can get pretty busy, and, for Lucy, this is exactly the case. For this purpose, a few changes have been made and now customers may come to the counter to place their orders, so as to keep the chaos down and keep things less hectic for the busy workers and their customers. In the center of the room sits the baby of the Leaky Cauldron - baby grand piano that is. It is not unusual to enter the Leaky Cauldron and see costumers playing away at the piano. However, this piano is widely special, even for the Wizarding World. Years ago, Ryoma, former owner Harley's partner, built it by hand and therefore as one plays each key the ivory gives off a little puff of colored smoke that rises up into the air and form shapes that begin to tell a story to the music. OOC: Please do NOT RP for Lucy. Doing so will cause your post to be edited or deleted depending on the severity. The piano is free for all to use so have fun with that and enjoy yourself. Also, please remember that Lucy does NOT take orders at the tables. You must go the Main Bar and Ordering Station for that. And a very IMPORTANT warning. Please please PLEASE make sure you have read all SS rules - especially those involving drinking. There will be a zero tolerance policy in regards to this rule. Delyth really couldn’t decide if she liked the man sitting in front of her now. What was it with him? He just seemed to demand information for her as if he it was his right to have it? No. It doesn’t work like that. You need to build trust before you get answers from this closed book. Although sometimes…Okay, all the time, the opportunity to be a little sassy was just too good to refuse. She couldn’t help but frown slightly at his declaration that none of his university books were this long. Sheesh, what did he study? How to interrupt people’s quiet time with rude behaviour? That takes, what, 1 pages and lots of colouring? “I read this for fun, yes” she replied curtly, her lower lip jutting out slightly at his obvious distaste for her book. Stupid man with his grey coat. He could at least buy one that’s remotely interesting and that stands out. What is he, some sort of spy or something? At that last thought, she smiled now, her own joke amusing her slightly. Deciding that there was no way she could read her book now, she tucked it back into her sunshine yellow backpack before finally answering his question. He could just wait. “I just finished university so I thought I’d come back home for a bit” briefly pausing now. She honestly didn’t really know what she wanted to do yet. Stupid Kevin had somehow managed to get her to think about something she’d low key been worried about. Lost in thought slightly now, she let out a soft ‘ugh’ under her breath at the thought of filling out job applications in the coming months. Giving her head a little shake now, she stopped chewing on her bottom lip and focused on the man sitting in front of her. “So, what do you do for a living that requires you to read small books?” she asked, rearranging her face into a smile. Kevin leaned back in the seat again and looked at the table. He had not ordered a firewhiskey yet now that he thought about it... Teasing this woman had been his main focus but now he wanted one. He was about to get up and order at the bar when Delyth spoke again.And she didn't sound pleased. "i could never read a book like that for fun but if you can. Go you" seriously why was she getting so agitated over a book? "What's your favorite genre to read?" he asked. So she had just finished her University years. That was impressive. No seriously it was... "Which University did you go to?" he asked curiously as he watched her put her book back in her bag. "I went to Edinburgh University and studied advanced potions" it had been because of his mother really that he had gotten in to potions as she was a potioneer herself. At the age of eight he could identify certain potions by just smelling them. Much to the dislike of the potions master at Hogwarts. Kevin grinned at the memory. Now that he thought about it, he had spend most of his detentions in his class. "Currently i'm working as a pensieve reviewer at the Ministry" he said, scratching his left arm. "Magical law enforcement" he added in case she did not know which department. "Do you want something to drink by the way? Im going to order a firewhiskey soon" if those people would just hurry up. Maybe he just didn’t realise her love for a good book on a warm sunny day. Maybe he was an idiot. Who knew? Either way, she ignored his question about favourite book. “What do you like to do? You know, for fun?” smiling slightly now. “You know, seeing as reading isn’t your thing” she continued, her eyes somewhat playful now. She wasn’t a complete…uh, meanie? She had a good side too. Sure it was covered up in bundles of sarcasm and heaps of sassiness but it was there. Somewhere. Watching his face as she mentioned she’d finished university was amusing. She wasn’t exactly one of those people who went about shouting that she was intelligent but it was nice for someone to notice it. “I went out to Quebec Wizarding University to study foreign languages. I have family over there you see and well, you know” giving a slight wave of her have now as if to say the rest is history. He studied advanced potions? He must be somewhat intelligent too although this does make it hard to believe he didn’t have to read some serious books to study for those exams. I mean, potions books can be bulky at times. “That’s impressive” a slight nod to him now, acknowledging his hard work. Honestly, she didn’t have the foggiest idea what a ‘pensieve reviewer? Did? But it sounded somewhat impressive. Caleb was silently listening to them. He still hasn't recieved his food yet. He was getting a little worried. He pulled out a book from his bag. Just something about magical creatures. It possibly was a superflous habit Kaysha had recently developed but actively frequenting the Leaky Cauldron was a great comfort to her. It brought her close to the Wizarding World since she was currently back at her previous job of teaching at a Muggle Secondary school. Today she was here with a purpose to more than just relax and mark a few test papers. Kaysha's bright blue eyes scoured the Leaky's Main floor but the persons she was expecting were not there as yet. That was fine; she would go ahead and select a table. She had no trouble locating one in a corner of the place. "Perfect,'' she thought and made a beeline for it. The woman settled on one of the chairs. All that was left to do was to wait. Tristan, holding Kalen's hand in one hand and a Butterbeer in the other, looked around the main floor of the Leaky. They were asked to meet up with Kaysha and he thought possibly Regina as well, but he wasn't quite sure. Usually quite tan, Tristan was starting to become pale. Not being out in the sun tending to creatures since November, his constant golden tan was really starting to fade. Once the winter weather calmed down he was going to have to do some sun bathing at on Kalen's roof or something. Finally spotting Kay, Tristan pointed his index finger holding the mug of Butterbeer, "Kale, she's there." He said with a small nervous grin, wondering what this meeting was all about. Kalen had his hand securely in Tristan’s as they walked into the Leaky Cauldron, while Tristan had a butter beer in his hand, Kalen’s free hand was wrapped around a mug of Earl Grey as usual. Old habits tended to die hard, even though he had gotten fired for drinking and passing out the stuff. But he wasn’t bitter.. oh no.. bygones and water under the bridge and all that. Besides he was kind of enjoying having Tristan at his house, living together was fun, though he knew the other man was restless and missed his creatures. He hoped that Tristan would be able to find a job soon where he could be outside again. His green eyes followed Tristan’s finger and he nodded. “I see her, let’s head over. ” He said with a nod as he squeezed Tristan’s hand and walked over with him. Lucy smiled as she roamed the main seating area, checking to be sure all of her customers were being taken care of. Seeing the Leaky full of customers brought joy to her heart. She skillfully worked her way between the tables, being sure to not disturb any conversations as she checked on water glasses and empty plates. Once she had made her way to the fireplace, she stacked the small pile of news papers and fluffed the pillows. She paused in the warmth of the fire, letting the heat sooth her tired muscles, and looked over the area for any signs of customers in need. MER-CY, was Phillip a nervous-nelly! He'd spent a tedious amount of time that morning filling out his new job application and could not stare out of the window ANY longer once Periwinkle, his owl, had disappeared behind the clouds on his way to the Ministry. 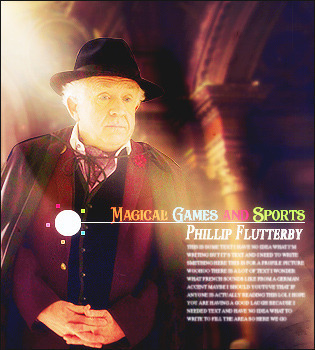 Donning a magenta cloak over his dark plum robes, the salt-and-peppered sixty-two year-old, Phillip Flutterby found himself in the Leaky Cauldron with a a glass of firewater clinking against the multiple rings stacked on his small grasp He'd found a spot by the fireplace despite the springtime warmth outside mostly because he found the chairs more comfortable on a tired hind-end. He took a second huge gulp and looked in to the flames as he tried to think of anything else to take his mind off of the Ministry official deciding OBVIOUSLY to not hire an old queen for their position in Games and Sports. A shape came between his gaze and the fire dancing in the grate and he allowed his eyes to focus on the figure. It seemed to be the woman who worked there. She was stacking newspapers and some magazines and looked to be taking a quick break. Distraction if he ever saw one. "Sweetheart, is can I knick one of those Daily Prophets from you?" Last edited by DanialRadFAN01; 11-07-2018 at 01:44 AM. Lucy almost didn't realize the gentleman was speaking to her. It had been quite some time since she had been called sweetheart. Smiling, she looked over at the man sitting near to where she was standing. "Of course." Her fingers flipped through the stack and she pulled out the duplicates before handing over the Daily Prophets. Noticing his glass, she inquired "May I refresh your drink?" She'd be happy to run over to the bar for him. Reaching for the paper she was handing him, he was caught off guard by her question. "My drink--? Oh MERLIN! I didn't realized I'd polished that one off so quick. You must think me a lush, huh?" he giggled. He must have drank faster than he realized being so deep in thought. "I'll take another one ma'am. But just one! Don't you go trying to sauce me up." he giggled again and started to flip through the paper. The best thing about being a bachelor was going out to eat. Then again, the worst thing about being a bachelor was going out to eat. Conley missed home cooked meals. His wife had always been a very good cook, where as he, had always been too busy to learn how to cook properly. He had always been complete rubbish at things like baking and cooking and potions; anything that required measuring and pouring and boiling and stirring and the like. And that is why he had gone into politics. He had placed his usual order at the bar for a pint of cider and some pasties and then had settled himself down at a table to go over some reports. Things had been busy since Nickels impeachment. Ambassadors had moved about, and he’d gotten a few transfer requests that he wanted to look into further. Lucy simply smiled and shook her head before heading off towards the bar. After grabbing a fresh drink and slice of spice cake, a special of the day, she made her way back to the gentleman. "Here you go, sir, and a slice of cake on the house." She sat the cake on the small table next to his chair. "Please let me know if there is anything else I can get for you." She would have been lying if she said said the news of Uncle Ryu going back to Japan hadn't gutted her. He had been there for her through so much, and with Nicolas it was increasingly more difficult to travel halfway round the world for a visit. But in time it would be easier, she knew. Hitching the toddler a little higher on her hip the blonde woman paused to glance around for him, eyes not catching his face just yet. "Nicky, love, we have to wait patiently for Uncle Ryu to get here, okay. Mummy has some yummy snacks for you to munch on," she said in hopes that the toddler would be pacified with this until the man arrived. Finding an empty table Dora slipped into a seat and held Nicolas on her lap, bouncing him slightly as the little man asked about Dada. "We will see Dada when we get home, little luv. Right now we wait for Uncle Ryu! Yeah! You are excited to see him, aren't you?!" Perhaps she could engage him in conversation as a means of distraction from whatever terrible two sized tantrum he was bound to throw. LOLOLOL Toddlers were so fun! The problem with being a teacher was that Layla had to work Monday to Friday which meant she could only go out at the weekends. Not that Layla was sociable anyway, in fact the only other time she went out was when she was coaching the girls football team or Sammy had dragged her out or it was date night with the wife. She was much more likely to be found sat at home on her own or watching the kid. Today she had been convinced by one of her closest (and one of very few) friends, Eden for a quick catch up. Life seemed to have gone ridiculously quick, one minute they had just left school and now they were both married with kids. If you’d have asked the grumpy 18 year old what life would have thrown at her in 10 years it wouldn’t have been this. She arrived at the Leaky Cauldron, one of the few places in the Wizarding World that she felt partially comfortable in. It was just like a normal muggle pub after all except with weird drinks and the occasional spell. The atmosphere was similar and the decor was kind of relatable. She ordered a firewhiskey (don’t tell her wife) and sat at a table kind of near the bar so that Eden could see her when she arrived. Eden had wanted KIDS on this friend date thing, but Layla had said HECKKAANO to that. And PFT. Eden had managed to convince her friend to let her bring her newest baby along at least. Little Arden! The baby girl had a thick blanket of golden brown hair curled atop her head with baby blues so deep Eden got lost in the mirror of them sometimes. She very much resembled Eden where Starr favored his father. With her baby on her back in a little sling, Eden eagerly made her through the Leaky as soon as she spotted her grumpy friend. Pout-faced, as usual. Eden grinned with all of her teeth at Layla, though. "Long time no seeeeeee grumpy gills!" she cackled a little and leaned over to give Layla a forehead kiss. She had forgotten if she had ever kissed Layla properly. Had they gotten up to things while at Hogwarts? Honestly, the brunette couldn't remember. So many girls (and guys) had caught her eye back in the day. She was much choosier now, at least, with her conquests. "Looking pretty and clever as ever, Layla." She winked and took a seat. Having a kid didn’t change the way that Layla felt about other kids. The ones at school were okay, most of them liked PE and she was the cool teacher that got them outside away from a classroom and doing things that didn’t involve a notebook and a pen. And they were usually impressed by how good the girl was at sports too. But other kids? Other loud, obnoxious, screaming children? She couldn’t stand them. She loved hers, don’t get her wrong, Ariadne was the apple of both her and her mother’s eyes. She didn’t mind too much that Eden wanted to bring her child. As much as it pained Layla to admit it, she adored Eden and didn’t want to lose her as a friend (she didn’t have many anyway). She spotted Eden heading into the Leaky and she allowed herself to smile just that tiny bit. A smile that was reserved only for people she actually liked. “Y’know I wouldn’t let anyone else call me that and get away with it” she rolled her eyes slightly. She waved at the baby (she wasn’t completely heartless) who lay in a sling along her mother’s chest. Her daughter was back at home with Bambi, Layla felt uncomfortable enough in the Wizarding world without being responsible for a child. Neither of those compliments were particularly accurate. Layla didn’t consider herself pretty, especially in comparison with the beauties she went to school with. Hogwarts was FULL of girls who could be models if they wanted. As for being clever, Layla wasn’t that clever in the book smarts sort of way but more in the world-wisely sort of way. She shrugged. “It’s not like we’re that old” Her face hadn’t changed but she had got more muscle since leaving school. Eden had to cackle, mischievously, again. "But it's so true. So true, and you know it. And Bambi, too." She smirked and kissed the top of Arden's forehead now. "No...we're not, no. I don't feel like it's even been all that long since we graduated...but then again, it feels long at the same time." She shrugged and grabbed a menu to try to figure out what she even wanted to eat. "I don't know what I'm feeling right now..." She shrugged. "Are you going to grab a drink or...?" Because she wasn't sure she should with Arden here and all. "How's your little one?" she asked curiously. "And Bambi? I wished Bambi could have come!" She missed her, too. She didn't come to the Leaky all that often since she lived in Greece with Phoenix. She used to work in Ireland, but she hadn't worked since a little before Arden was born, now. She'd get bored and eventually go back, but for now she was enjoying time at home with Arden and Starr. "What are you doing these days? Still the same old?" Layla had been a teacher, right? In the muggle world?